Crime figures: Is violence rising? Whether crime is rising or falling is hugely important. It can affect how much is spent on policing and other related services, even how people vote. But working out what is happening is not an exact science. And those two sources often throw up quite different results. For example, in recent years police records have shown significant increases in crime while the survey has suggested crime is falling. Despite this difference, neither source is wrong - they just measure different things. The more difficult question is which best represents how much crime is actually being committed. We're talking about England and Wales only, because Scotland and Northern Ireland have separate criminal justice systems. According to the most recent survey, which is conducted face-to-face and asks individuals about their personal experiences, levels of crime in the year to September 2018 remained pretty stable compared with the year before. Crimes recorded by the survey have been falling for years, so this represents a slowing of improvements. There was no change in the overall number of violent offences - the only significant change was seen in the category of "computer misuse" (generally fraud and financial crimes), which went down by a third. On the other hand, police records suggest crime went up by 7% in the past year and violent crime went up by 19%. Violence that actually resulted in injury or death went up by 7%. So which of these two very different pictures - one showing no change to the levels of violence people are experiencing and one showing it going up quite considerably - should we trust? The crime survey is generally considered a good measure of crime experienced by individuals because it is not affected by changes to how crime is recorded. It also includes crimes that have historically been under-reported to the police. However, it has some limitations. It does not cover crimes against businesses or people living in communal residences like care homes, prisons or student accommodation. It is also excludes crimes where there is no victim to interview, for example murders and drug possession or dealing offences. And there is a time-lag in the survey, so the figures are older than police figures. This means the survey is very good for looking at long-term trends but less good at spotting emerging ones. The trouble with police records is they can sometimes be a measure of police activity rather than of crime itself. They're by definition not good at capturing offences that people under-report to the police, such as petty theft or sexual offences. 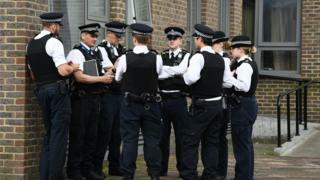 They are skewed by police priorities - that is, focused efforts from police to tackle certain crimes can also lead to higher levels being recorded. And police-recorded crime is sensitive to changes in recording practices, for example, the number of crimes described as "violence against the person" went up considerably in recent years, after two new harassment offences were added to the category. The Office for National Statistics (ONS) said this didn't reflect a genuine increase in crime. Police recorded crime had its designation as a national statistic removed in 2014. But, that being said, police-recorded crime is very good measure of what's happening to well understood and well reported crimes such as burglary. Those figures suggest there have been genuine increases in less common but more serious crimes such as weapons offences over the past couple of years. Helen Ross from the ONS's centre for crime and justice, said: "In recent decades, we've seen the overall level of crime falling - but in the last year, it remained level." "Burglary, shoplifting and computer misuse are decreasing but others, such as vehicle offences and robbery, are rising. "We have also seen increases in some types of 'lower-volume, high-harm' violence, including offences involving knives or sharp instruments." But, the statistical body says, this should be seen in the context of an overall fall in crime over the past decade, adding that the crime survey "provides the best measure of trends for overall violent crime". "The survey covers crimes that are not reported to or recorded by the police and so tends to provide the better measure of more common but less harmful crimes." Scotland has a similar survey on perceptions of crime that runs every two years. In the most recent survey, for 2016-17, crimes committed against adults were down 34% since 2008-09 and 16% since the previous survey, in 2012-13. Crimes recorded by the police in Scotland are at their lowest level since 1974.